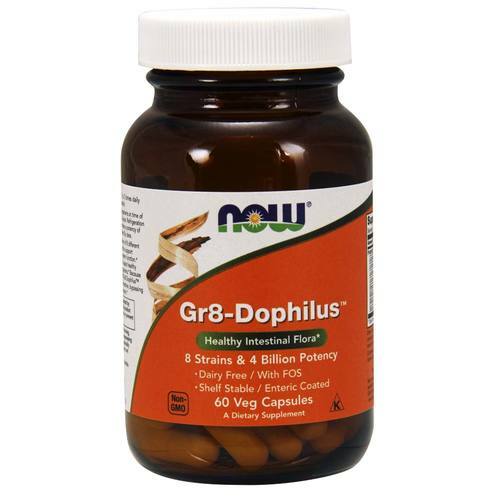 Now Gr8-Dophilus is formulated in an enteric coated capsule. Warnings: Keep out of reach of children. Do not eat freshness packet. Keep in bottle. Do not take more than recommended dosage. Notes: Contains no salt, wheat, milk, egg or shellfish. Vegan. Kosher. Dairy free. Recommended Use: As a dietary supplement, take 1 Vcap 1 to 3 times daily between meals or on an empty stomach. The customer reviews posted below are based on individual consumer experiences and may NOT necessarily represent what expected results will be from using or taking Now Foods Gr8-Dophilus - 60 VCapsules. These results may not be typical and you should not necessarily expect to receive the same results. Actual results may vary. We are using this product to help in the process of healing my husband's gut. It works primarily in the intestine which is awesome. We use it in conjunction with the NOW brand super enzyme which works primarily in the stomach. And we like that they're both organic. Another great product., I have tried the other probiotics products by NOW and was very happy I decided to try these as they have a slightly broader spectrum of bacteria, I have to say that so far I cannot fault them. And as usual excellent service from e-Vitamins. I started taking this product at the advice of the store owner of Love My Whole Foods in Florida while on vacation. I feel like my belly is less bloated with this product and believe that it helps my Chronic Fatigue and Fibromyalgia since both are an inflammation of the body. I love Gr8-Dophilus! I was first introduced to this product by Love Whole Foods in Daytona Beach, Florida. I have thyroid issues, chronic fatigue and fibromyalgia. This product helps to keep me regular and assist with digestion. I would highly recommend this product.